Talon Menthol Filtered Cigars 200 Little Filtered Cigars - Talon Filtered Little Cherry Cigars - Talon Filtered Little Menthol Cigars - Talon Filtered Little Regular Cigars - Talon Filtered Little Silver Cigars - Talon Filtered Little Vanilla Cigars - Talon Filtered Little Sweet Cigars.Talon Filtered Little Cherry Cigars - Talon Filtered Little Menthol Cigars - Talon Filtered Little Regular Cigars - Talon Filtered Little Silver Cigars - Talon Filtered Little Vanilla Cigars - Talon Filtered Little Sweet Cigars. Talon Menthol Filtered Cigars are an affordable line of little filter smokes crafted by the same manufacturer that creates the popular Henri Wintermans brand. Talon Filtered Cigars uses top-quality tobaccos for a rich and rewarding smoke every time you light one up. Talon Little Filtered Cigars line is available in a mouthwatering array of aromatic and non-aromatic flavors that include Talon Filtered Little Cherry Cigars - Talon Filtered Little Menthol Cigars - Talon Filtered Little Regular Cigars - Talon Filtered Little Silver Cigars - Talon Filtered Little Vanilla Cigars - Talon Filtered Little Sweet Cigars. 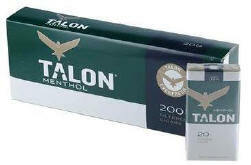 Talon Menthol Filtered Cigars come to you in affordable 10-packs with 20 cigars in each pack, 200 filtered cigars. When there just isn't a lot of time to enjoy a cigar, Talon Menthol Filtered Cigars 200 Little Filtered Cigars come to the rescue. Mild, sweet tasting and wholly satisfying, these filtered cigars are made with a secret blend of quality tobaccos and special flavorings, Talon Menthol Filtered Cigars affordable price makes it even better.